Hastings United will be aiming to make it three straight wins for the first time all season when they travel to South Park today (Saturday). 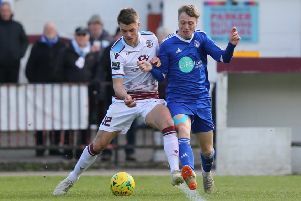 The Reigate-based club had been tumbling down the Ryman Football League Division One South table until winning on Easter Monday, but United boss Nigel Kane regards the fixture as “definitely winnable”. He said: “This would be one you would want in the run-in, definitely. They’ve only kept one clean sheet at home all season and they’ve only won four games since Christmas, but they’ve got the league’s leading scorer in Chris Smith and he will be their main threat. Ade Olorunda is still suspended and Richard Rose starts a two-game ban, but Tyrell Richardson-Brown and Kyle Holden should return. Sam Cruttwell (calf/Achilles) is doubtful. There’s a bit of optimism running through the squad now and if we can get another three points on Saturday it will be absolutely tremendous. Ryman League, Division 1 South: South Park v Hastings Utd. Macron Store Sussex County League, Reserve Section Challenge Cup semi-final: Westfield v Mile Oak. Reserve Section (East): Lingfield v Little Common; Southwick v Bexhill Utd 4.30. Macron East Sussex League, Premier Division: Battle Baptists v Iden; Hollington Utd v Rock-a-Nore. Division 1: Bexhill AAC v Sidley Utd 1.30; Icklesham Casuals v Wadhurst Utd; Sandhurst v Ticehurst. Division 2: Herstmonceux v Catsfield; Pebsham Sibex v Crowhurst 3.30; JC Tackleway v Old Hastonians. Division 3: AFC Hastings v Sovereign Saints. Division 4: Bexhill AAC II v Bexhill Utd III; St Leonards Social II v Little Common III. Division 5: Hailsham Athletico v Mayfield (double header 2 & 3.30); Magham Down v Sedlescombe Rangers II; Parkfield v Grasshoppers Old Boys; Ticehurst II v JC Tackleway II (double header 2 & 3.30); Victoria Baptists v Battle Baptists II; Wittersham II v AFC St Leonards. Division 6: Hawkhurst Utd II v Hampden Park Utd; Robertsbridge Utd II v FC Westridge.